Perfectly situated atop a hill with stunning views of the surrounding neighborhoods, Verde Pointe is ideal for those who want to be part of the action but not right in the middle of it. Located just a few blocks from the train, minutes from downtown DC and adjacent to a beautiful bike trail, Verde Pointe offers a serene mix of comfort and convenience. Just a five minute walk takes you to the Court House Metro station where you can catch the Orange and Silver lines out to notable regional hotspots such as George Washington University, The White House, Capitol Hill, Verizon Center, Tysons Corner and more in just minutes. 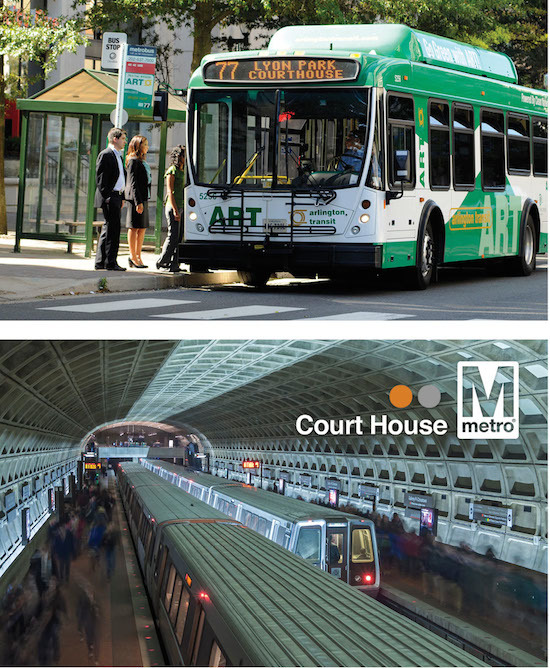 You can also catch multiple Arlington Transit Bus (ART) or Metrobus lines on Lee Highway, Wilson Boulevard and Clarendon Boulevard. Featuring secure space for up to 100 bikes, a nearby Capital Bikeshare station and direct access to the renowned Custis Bike Trail, Verde Pointe residents will enjoy safe and fun biking across the DC metro area. If you prefer to drive, Verde Pointe is centrally located near local highways I-66, US Route 29 and US Route 50, with easy access into DC and the Virginia suburbs. Our secure parking garage is available if you own a car or you can rent one through local car sharing programs.